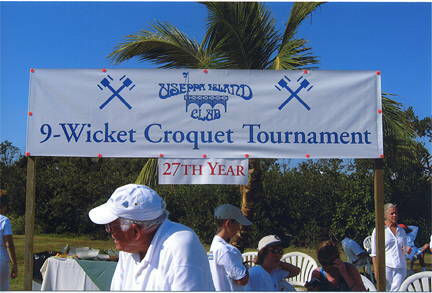 On December 30, in 75-degree weather, fifty-four people gathered to play 9-wicket croquet doubles in Useppa Island’s 27th annual tournament. Fourteen courts were laid out so that all teams could play at once. The scorer’s sheet was a representation of the St. Louis Ferris wheel concept. Play started on rough St. Augustine grass at 9:00 a.m. after a very nice continental breakfast. Each game was 45 minutes long and all teams got to play five games. Play paused after three games for a wonderful sandwich buffet lunch. In the end there were two undefeated teams playing for the championship. Andrew and Mary Shook took on Ginny Amsler and her teammate David Nutting, the latter playing croquet for the first time. Ginny, the only 6-wicket player in the group, played the fourth ball. As soon as she got through the third wicket she attacked and picked up a three-ball break to run eight wickets. The balance of the game was spent getting her partner to within four wickets of the home stake. Then time ran out as Andrew and Mary got to the turning stakes. Ginny has never won a Championship so this was a major event in her life. Of course this was also a first for David. So congratulations to Ginny and David.